Choice of dressings: House Balsamic Vinaigrette, Raspberry Vinaigrette, Low Fat Ranch, Fiesta Ranch, Hidden Valley Ranch, French, Bleu Cheese, Caesar, 1000 Island. Italian, Poppy Seed, Olive Oil and Vinegar. Your choice of grilled or fried chicken over top mixed greens, topped with bits of bacon, cherry tomatoes, cucumber, red onion and colby cheese. Mixed greens topped with bacon bits, buffalo chicken tenders, tomatoes, fried tortilla strips and colby cheese. Served with a warm breadstick. We recommend our fiesta ranch dressing. Mixed greens topped with strawberries, mandarin oranges, cashews, tomatoes and julienne slices of Swiss cheese. Served with a warm breadstick.We recommend poppyseed dressing. A crisp, cool delight. Loaded with lean turkey, ham, tomatoes, fresh cucumbers, red onions and julienned Swiss and colby cheese. Served over a bed of mixed greens with a warm breadstick. 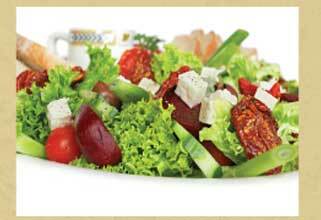 Mixed greens served with cucumbers, tomatoes, red onions and croutons. Served with your choice of dressing and a warm breadstick. Seasoned ground beef, diced tomatoes and shredded colby cheese. Served over a bed of mixed greens in a crispy fried tortilla shell. Served with our homemade salsa and sour cream. Crisp hearts of romaine lettuce tossed with our signature Caesar dressing, crunchy seasoned croutons and freshly grated romano cheese. Served with a warm breadstick. An Italian classic! Completely homemade from an old Uccello family recipe. Brimming with fresh vegetables, kidney and garbanzo beans. Simmered for hours in a light herb tomato broth. A sensational take on an old classic! Thick and meaty, loaded with ground beef, beans and onions.